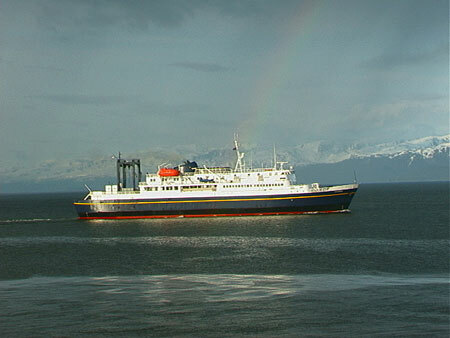 The Tustemena Ferry is one of the Alaska ferries that is used to cross Kachemak Bay out of Homer. This photo was taken just outside of Land's End Resort on the Homer Spit in late May, 2000. It had just started to rain and a beautiful rainbow showed up on the bow of the ferry. I couldn't resist a quick photo! Copyright © 1999 - 2001 Alaska Photography & Travel Guide,All Rights Reserved.